Dr. Daniel S. Lauer announces the move of his periodontal and implant dentistry office from Palm Beach Gardens to its new location in Jupiter. Jupiter, FL, March 07, 2019 --(PR.com)-- Starting in March 2019, Precision Periodontics & Implant Dentistry will be practicing out of its new office location in Jupiter, Florida. Board-certified periodontist Daniel S. Lauer, DMD says this transition to a new address is an upgrade for his practice, intended to enhance care for its growing patient base. Previously located on Prosperity Farms Road in Palm Beach Gardens, the practice now operates at the following address: 3535 Military Trail, Suite 207, Jupiter, FL 33458. As part of the practice’s move, Dr. Lauer has added state-of-the-art technology in an effort to continually provide innovative and precise periodontal care. He says 3D printing technology and “no-impression” digital intraoral scanning with the iTero® Element 2 have been installed, offering advanced capabilities for creating temporary crowns and surgical guides for dental implants. With more than 2,700 square feet of space, Dr. Lauer notes the larger office will better accommodate his patients and the new technology. When patients arrive for their next appointment, he says they will have more parking options, helping make their visits more convenient and efficient. 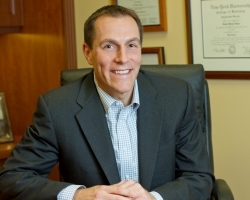 Dr. Lauer is certified by the American Board of Periodontology and is a member of organizations such as the American Academy of Periodontology, Academy of Osseointegration, and American Dental Association. He is proud to say he grew up in Palm Beach Gardens/Jupiter and graduated from the University of Michigan. After completing dental school at the University of Florida - College of Dentistry, he completed a residency in periodontics and implantology at New York University. At Precision Periodontics & Implant Dentistry, Dr. Lauer offers comprehensive periodontal care ranging from dental implants and bone grafting to laser gum surgery and receding gums treatment. He is available for interview upon request. The practice can be reached online at precisionperio.com and facebook.com/PrecisionPerio.